A social enterprise which repairs and refurbishes mobility equipment in Clydebank for elderly and disabled customers is celebrating after news that it is to receive funding from Zero Waste Scotland to train staff in essential repair skills. 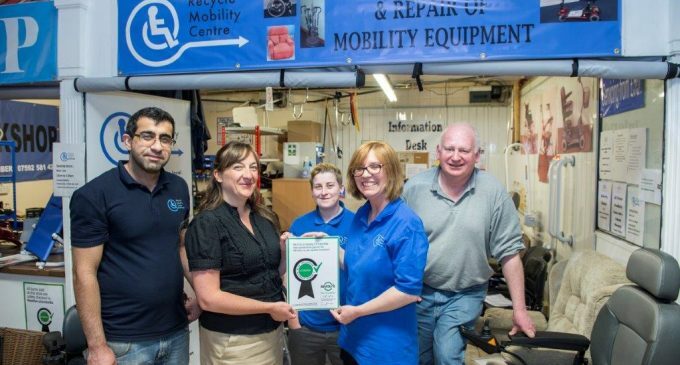 Recycle Mobility Centre was revealed as the 50th Revolve-certified store in Scotland after meeting the criteria for quality and customer service in second-hand stores. The business, based at Clydebank’s Market Village, offers repairs, refurbishments and sales, and has been awarded a grant from Zero Waste Scotland to train staff in reuse and repair skills, including developing one to SVQ level 2 in Electrical Engineering. Sam Moir, Revolve Manager, Zero Waste Scotland, added: ‘Recycle Mobility Centre provides an essential service for many people in the local areas, professional workmanship and great customer service. As Scotland’s national reuse standard which is managed by Zero Waste Scotland, Revolve acts as a quality kite mark for shoppers when buying high quality second-hand goods. Picture shows Revolve’s Sam Moir presenting the Recycle Mobility team with their certificate.